The west coast of the United States is inclusive of Washington, Oregon, California, and to a lesser extent Nevada and Arizona. The major western cities of Los Angeles, San Francisco, Seattle, San Jose, Oakland, Sacramento, Fresno and Portland provide an endless array of things to do, amazing sights to see and much fun to be had. The west coast is a hub of activity and the ideal destination for a laid back seaside escape. West Coast RV rental is an extremely popular option for travel in the United States. All the major motorhome rental companies, including El Monte RV, Road Bear RV Rentals and Cruise America have depot locations in cities right up the west coast, including the inland western states of Arizona and Nevada. These RV rental depots are conveniently located in the major cities of each of these states and are easy to find. The state of Washington is located in the Pacific Northwest region of the United States. Bordered by Oregon and Idaho, Washington is home to cities such as Seattle, Tacoma and Olympia. Boasting famous icons like the Space Needle and Mount Rainer National Park, Washington is an ideal destination for an RV rental holiday. Oregon is also located in the Pacific Northwest of the United States. Sharing a border with Washington, Idaho, Nevada and California, Oregon is a fantastic place to visit during west coast travel. Home to beautiful cities like Salem and Portland, Oregon is an ideal destination for a west coast holiday. 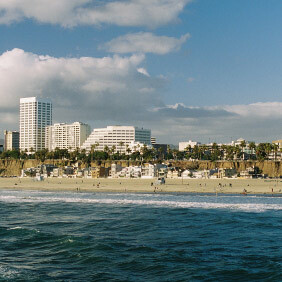 As the most populous state in the United States, a trip to California is an essential in any west coast travel plan. Surrounded by Oregon, Nevada and Arizona, and enjoying one of the best stretches of the Pacific Ocean, is is perfect for RV California all year round. Situated in the south-western region of the United States, Arizona is another great destination for any west coast travel. Most famous as the home state of the Grand Canyon, Arizona is an ideal destination for a holiday, as you will be transported into a world where freedom and leisure are the norm.